FATBOYLURES - Hand Crafted Custom Fishing Lures by Mark Murphy of Fargo, ND, USA. Customized Personalized FISHING Lures, Muskie, Musky, Pike, Bass Fishing Lures. Walleye, Sunfish, Cisco, Pike, Bass, Trout, Northern, Birthdays and company gifts, fishing lures, fishing tackle, tackle box, accessories, shirts, hats, pole, reels, photos, information, lakes, maps, safety floats, boat, boating, casting, jigs, baitfish, bait, walk the dog, spoons, spinners, buck tails, tail, poppers, floaters, sinkers, bobbers, minnows, hooks, claws, razzersharp, treble, hookCustom made for you. HandMade Hand Made Lures for wedding gifts, for birthdays, great personalized gift! 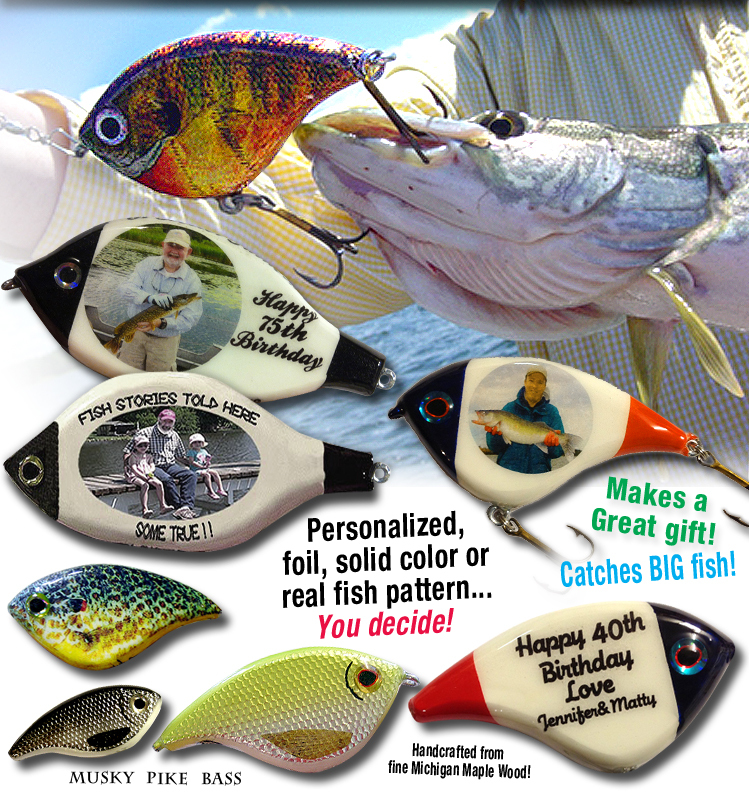 If you're looking for a special "one-of-a-kind" custom gift for that special person in your life, check out the CUSTOMS page for more ideas on how you can personalize your own lures. Not only are these made tough to withstand the largest gamefish, they are something that will be used and cherish every time they go out on the lake! Mark makes all of the lures BY HAND using only the best Michigan Maple wood available! All metal components are American made! No lure will ever look exactly the same as the lures are produced by hand and not by computerized machines! Like FBL on Facebook! Click icon. You get four - 5" Custom Original Floating Fatboylures with 4 beautiful Hand-made Solid Oak Gift Boxes. Lures will be tipped in your choice of colors. Also included is FREE SHIPPING for USA. $50 shipping anywhere else in the world. Delivery takes about 6 weeks, so don't delay! Click on the image below to see the FBL GLIDERS. Accepting most major credit cards over the phone! Paypal too! © 2019 Mad Musky Logo is a registered trademark of muskyfreak.com and used with permission.